Dry sanitation requires the handling of faeces, which vary in age and degree of transformation. Rheological data are necessary to support the design of equipment to handle faeces. The rheological properties of fresh human faeces were measured using a variable-speed rotational rheometer. Samples were further tested for moisture content, total solids, volatile content, and ash content. 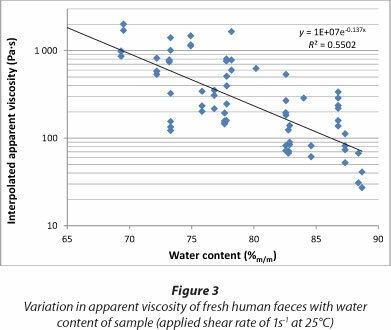 Faecal samples were found to have a yield stress; there was a decrease in apparent viscosity with increasing shear rate. For any given shear rate, higher apparent viscosities are associated with lower moisture contents. Across a range of water contents of 58.5% to 88.7%, apparent viscosities of 27 Pa-s to 2 014 Pa-s were measured at a shear rate of 1 s-1. During constant shear tests, the apparent viscosity of all faeces was found to decrease asymptotically, where the minimum apparent viscosity value increased with decreasing moisture content. A structural recovery test indicates that human faeces are thixotropic in behaviour, where the viscosity permanently decreases to 0.5% of the initial value after a 20 s exposure to a shear rate of 10 s-1. A linear relationship between viscosity and temperature was found, with a recorded 30.6% decrease in viscosity for a 35.6 °C increase in temperature from 13.4°C. The Bill and Melinda Gates Foundation have presented a Reinvent the Toilet Challenge to researchers (Global Development Program, 2012). The objective of the challenge is to provide a sanitation solution for poor unserved households at a user cost of less than USD 0.05 per person per day. A wide range of processes have been proposed. Some of these proposals involve the source separation of urine and faeces; each of these streams is then handled separately. This implies that that these streams need to be mechanically handled prior to subsequent processing, e.g., drying, gasification or combustion. Viscosity data are needed for the design of the mechanical handling equipment. Very little literature is available for the rheology of human faeces and the available information is not comprehensive. The information that is available on the properties of human faeces (Patel et al., 1973) and the rheology of similar matter, namely, cattle manure slurries (Chen, 1986; El-Mashad et al., 2005), has been used to estimate the behaviour of fresh human faeces. Moisture content has been identified as the most significant parameter in the variation of the rheological properties of faecal matter (Chen, 1986). The composition of faecal matter can vary significantly among different people and from different faecal samples from the same person. This variation is attributed to subjects' diet, age, health, lifestyle, climate and geographical region (Lopez Zavala et al., 2002; Buzie-Fru, 2010). This study investigated the rheological behaviour and rheological properties of fresh human faeces, with the purpose of informing the future design of faecal-handling equipment. Viscosity data, fluid behaviour and physical property relationships of human faeces were investigated and established within the context of the requirements for mechanical handling equipment. A total of 30 samples of fresh human faeces were analysed for rheological and chemical properties. Faecal samples were collected from Durban on the east coast of South Africa. The donors were young adults between 20 and 29 years of age. The donors were of mixed ethnicity, namely African, Caucasian, Coloured and Indian, and the diet was uncontrolled, but mostly included traditional western, Indian and South African diets. To prevent degradation of faecal samples, they were immediately placed by the donor in a cooler box with frozen ice bricks, after they were produced, and transported to the laboratory. Faecal samples were stored in a cold room at 2°C, and tested within 1 week of production. Faecal samples were photographed, weighed and classified using the Bristol Stool Form Scale (BSFS) proposed by Lewis and Heaton (1997), which is considered to be a useful tool for categorizing fresh faecal samples prior to testing. The BSFS classifies human faeces into different categories based on their physical appearance. The scale ranges from a 'Type 1' stool which is described as 'separate hard lumps, like nuts' to a 'Type 7' stool which is described as 'watery, no solid pieces'. An Anton Paar Physica MCR 51 rotational rheometer was used to measure the rheological properties of faeces. For faecal samples with a BSFS factor of 1 and 2, a cone-plate setup was used (CP50-2 attachment). Faecal samples with a BSFS factor of 3 through 7 were tested using a Couette geometry, (CC27 attachment). The rheometer torque resolution is 100 nNm, which will directly impact the precision with which measurements are taken. The magnitude of experimental error is determined by the torque resolution and the geometry of the experimental setup. The rheometer was calibrated using a standard calibration fluid of alpha-olefins. The rheometer possesses operational limitations which affected the shear rate range for testing, namely a minimum measurable torque value of 250 µΝη and a maximum shear stress of 2 350 Pa, and only data which fell within these limits were considered as being reliable. Samples were introduced to the rheometer by slicing small pieces of faecal matter from a sample, with a total sample volume of 15 mℓ, and placing them within the measuring chamber. To minimise any damage to the structure of the sample the measuring instrument was moved into position within the chamber very slowly, in order to minimise applied shear stresses on the sample. 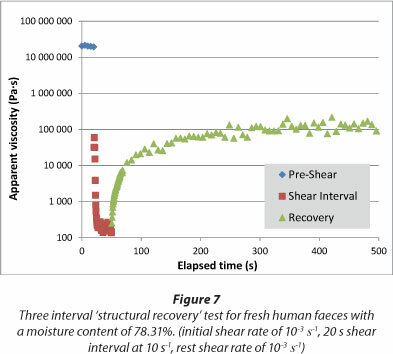 Shear rates above 1 s-1 resulted in shear stresses that caused destruction of the faecal sample structure, changing the mechanical properties of the sample. Flow curve tests were performed by increasing the shear rate exponentially, in order to reduce the amount of time at which the sample was subject to shear rates above 1 s-1, limiting any structural damage. Experiments were performed repetitively on the same sample to determine the repeatability of flow curves and to establish if any damage to structure had taken place, and to quantify the structural damage if any existed. To investigate the temperature dependency of fresh human faeces, temperature sweeps were performed while a constant shear rate was applied and the apparent viscosity was measured. To negate any time dependency behaviour of human faeces in the temperature dependency test, samples were pre-sheared prior to the temperature sweep, for 1 h at the same shear rate at which the temperature sweep would occur. The temperature range of these tests was from 10°C to 50°C, as this encompasses the expected temperatures of the operating conditions of the faeces-handling processes. Moisture, volatile and ash content analyses were performed on samples after testing with the rheometer. Sample moisture content was determined by drying a sample of known mass (approximately 8 g) for 24 h in an oven at 105°C and measuring the sample mass after drying. Solid volatile content was determined by incinerating a sample of known mass for 2 h in a furnace at 550°C and measuring the sample mass after incineration. The measured moisture contents of the sample base ranged from 58.5% to 88.7% by mass (massH20/masstotal), with a mean moisture content of 77.1% and a standard deviation of 7.6%. 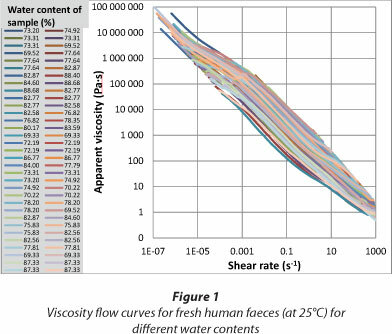 Shear rate-shear stress flow curves were produced for faecal samples of various moisture contents, by sweeping through a range of shear rates and producing a corresponding range of shear stresses. Shear rate-apparent viscosity flow curves were produced by calculating apparent viscosity data for each shear rate-shear stress data point on every curve. 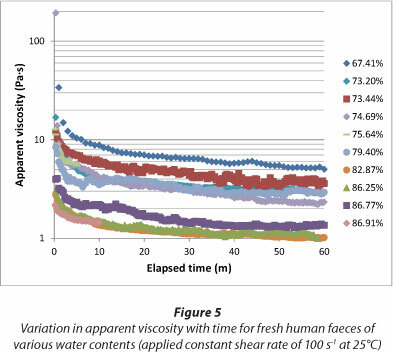 Figure 1 shows all 79 shear rate-apparent viscosity flow curves obtained from the 30 faecal samples, identified by their moisture contents. Figure 3 shows a moderate power law relationship between apparent viscosity (at fixed shear rates) and moisture content. This would indicate that there are factors apart from moisture content that may influence the rheological properties of human faeces. The range of volatile matter content of all fresh human faeces samples was 80.4% to 92.4% by mass on a dry basis, with a mean volatile content of 87.6% and a standard deviation of 3.1%. 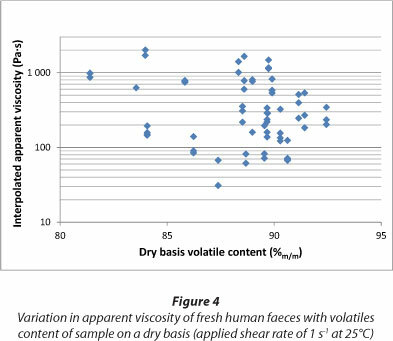 When the total volatile matter content of samples on a dry basis is plotted against measured apparent viscosity values at fixed shear rates, as shown in Fig. 4, there is no discernible relationship, as the data points are scattered within a broad cluster. Constant shear tests were performed at a constant shear rate of 100 s-1 on 8 faecal samples for a duration of 1 h, and the resulting curves are shown in Fig. 5. By comparing the multiple curves for constant shear rate tests, it was found that the value of the apparent viscosity after 1 h was proportional to the sample moisture content and shear rate value, where a higher apparent viscosity is associated with a lower moisture content. Regardless of the magnitude of the shear rate at which the test was performed, the apparent viscosity of the faecal sample decreased asymptotically. The results of these constant shear tests are in Fig. 5 and Fig. 6, where Fig. 5 tracks the apparent viscosity of the samples over the 1 h duration, and Fig. 6 shows the final apparent viscosity value after the 1 h period. The data shown in Fig. 5 and Fig. 6 confirm the relationship between the apparent viscosity and moisture content. The time-dependent nature (structural recovery) of faeces was determined by undertaking 3-interval tests. The results ol one test are shown in Fig. 7, where the apparent viscosity of a faecal sample was measured at near-rest (first interval), after a shear rate of 10 s-1 was applied for 20 s (second interval). Then in the third interval, the apparent viscosity of the sample was measured again at near-rest, so that the response could be monitored. Figure 7 clearly shows that faeces are thixotropic, as the apparent viscosity of the sample decreased under a load and increased while at rest. However the structure did not recover fully, as the magnitude of the apparent viscosity after 1 h of rest in the third interval was 0.5% of the initial apparent viscosity. Figure 8 shows a temperature sweep test on a sample with a moisture content of 78.31% and a dry-basis volatile solids content of 84.50%. At 13.4°C an apparent viscosity of 405 Pa-s was measured, and at 49°C apparent viscosity was 281 Pa-s. This translates to a 30.6% decrease in viscosity for a 35.6°C increase in temperature from 13.4°C. 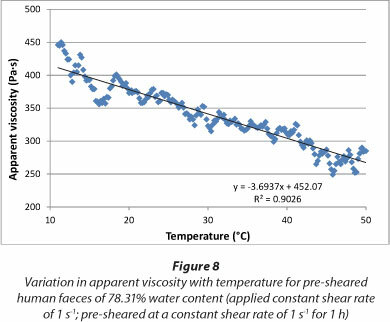 The decrease in viscosity over the temperature increase was linear, indicating a linear relationship between temperature and apparent viscosity of the tested temperature range. 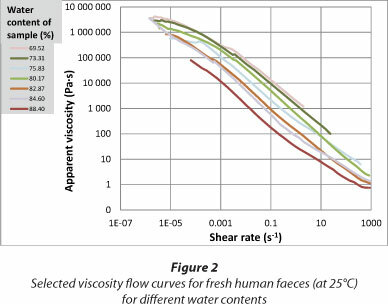 Fresh human faeces behave as a structured fluid with a yield stress at low shear stresses, while at shear rates beyond the yield point, apparent viscosity decreases with an increase in shear rate. In the context of the Reinvent the Toilet Challenge, this will be significant in identifying optimal operating conditions for mechanical faecal-handling equipment. 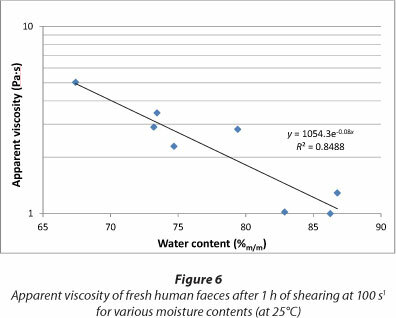 Moisture content has a significant impact on the viscosity of fresh human faeces, with higher moisture content associated with lower apparent viscosity. This relationship will give a useful indication of the shear rate ranges expected to be experienced by faecal-handling equipment, for any given moisture content. Chemical properties of faeces may also be related to the rheology of faeces; the nature of this relationship will be determined in future work. Further work may extend to modelling the viscosity of faeces as a function of moisture content and other properties. Fresh human faeces are thixotropic. This indicates that further research is required into possibilities of pre-treating faeces through mechanical means, so that the viscosity is decreased significantly before mechanical handling processes. Fresh human faeces exhibit temperature-dependent behaviour, where there is a linear relationship between viscosity and temperature, with lower viscosities at higher temperatures, over a temperature range of 10°C to 50°C. This is significant as operational temperatures and ambient temperature can influence the viscosity of faeces within the proposed process. Preheating of faeces will also result in a lower viscosity. The relationship between apparent viscosity and other chemical properties should be investigated. An attempt should be made to model fresh human faeces as a Herschel-Bulkley fluid with the available parameters. The authors acknowledge and appreciate the Bill & Melinda Gates Foundation for financial support of the research leading to this publication. The findings and conclusions contained within are those of the authors and do not necessarily reflect positions or policies of the foundation.